I have a confession to make this DIY jewelry craft idea is not my own, but one that my mum showed me. My mum loves to wear bright and colourful clothes, she doesn’t do neutral. 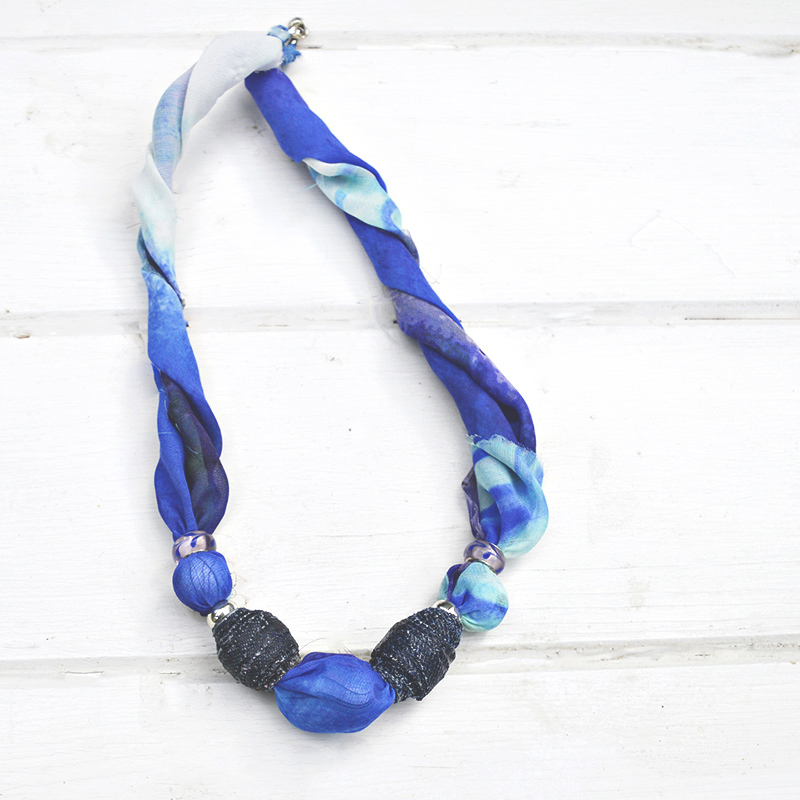 She has loads of old silky scarves which she upcycles into gorgeous colourful necklaces to match her outfits. I did, however, add my own touch to this craft by adding upcycled denim beads. I’m constantly trying to find new uses for old denim. Denim upcycling is one of my crafting obsessions, you should check out my upcycled denim pinterest board. The necklaces make a lovely gift and can be personalised by using an old scarf or blouse of the recipient. Personally I more of a bracelet person than necklaces, so I use the same technique to make bright colorful bracelets to match my outfits. Old silk scarf or blouse. You can use synthetic material as long as it has a fine and smooth silky feel to it. Old beads, wooden ones or ones from old necklaces. Don’t worry about how they look some of the less pretty ones will be hidden by the scarf. If making the denim beads you will also need the following. 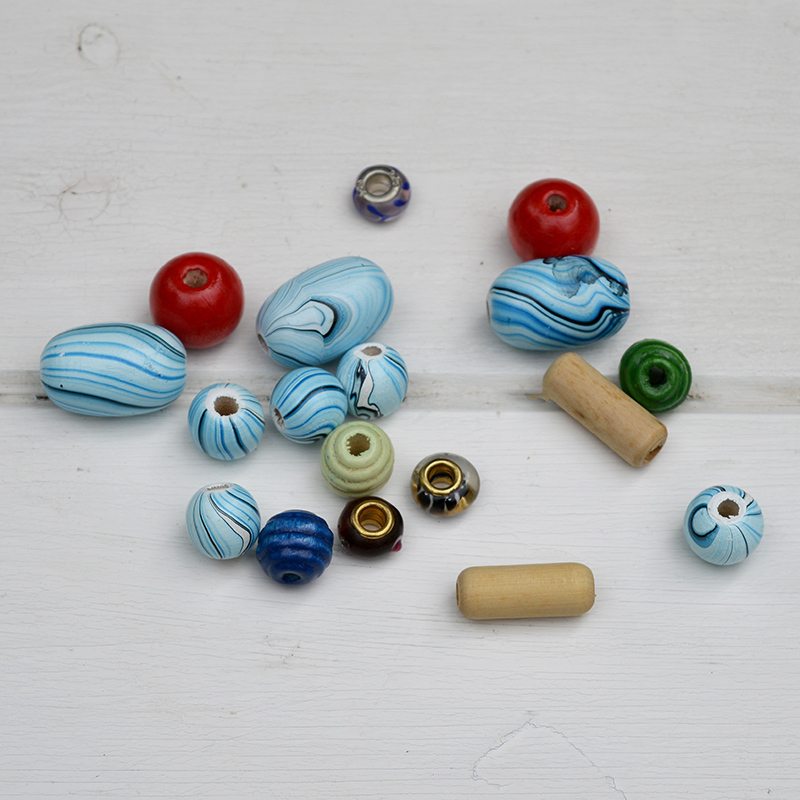 The way you make denim beads is pretty much the same way as you make paper beads. Firstly you need to make a cardboard template to ensure that your denim strips are all the same shape and colour. This cardboard template is a very tall triangle. When making this template, you need to bear in mind that the width of the base of the triangle will be the width of your beads and the length will determine how fat they are. Secondly with your template cut out strips of denim using a rotary cutter and board. 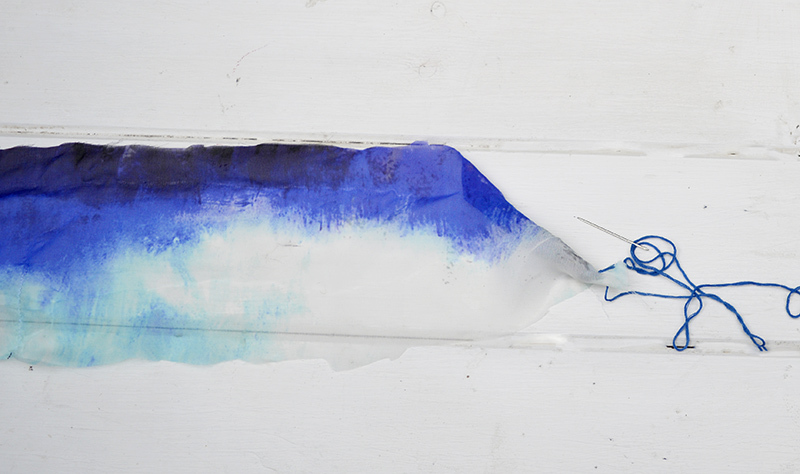 Paste the right side of the strip of denim with fabric mod podge. Starting with the fat end of your denim strip, wind it around a pencil. Make sure the glue side is facing up. The denim fabric should stick to itself as you wind around the pencil. When finished remove the pencil before the glue dries or you might find it gets stuck. I used a pencil as I needed a big hole for my beads, to thread fabric through. 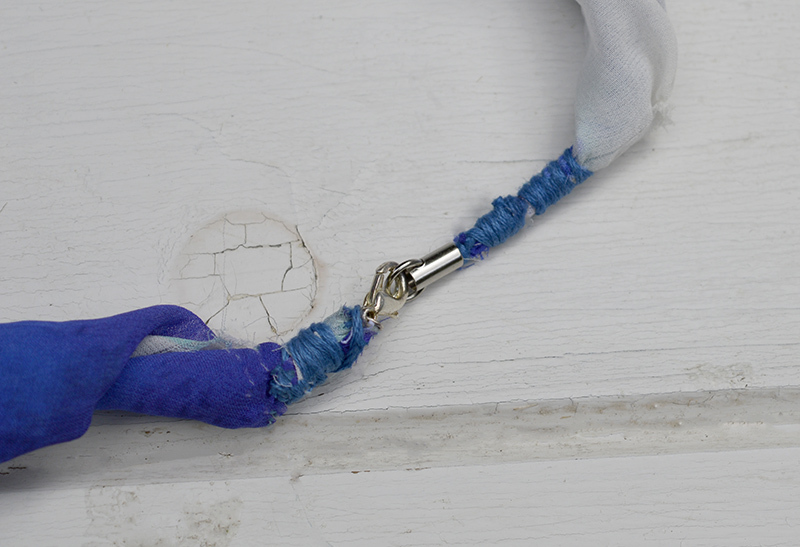 If making denim beads for other crafts or DIY jewelry and you want a smaller hole then use a wooden skewer instead. Decide whether you’re making a necklace or a bracelet and cut your fabric to the appropriate length. You want a strip approximately 3-4 inches wide. It’s best to overestimate the length of fabric you need, as you can always shorten it later. Thread some embroidery thread onto the darning needle and thread this through the end of your fabric strip. 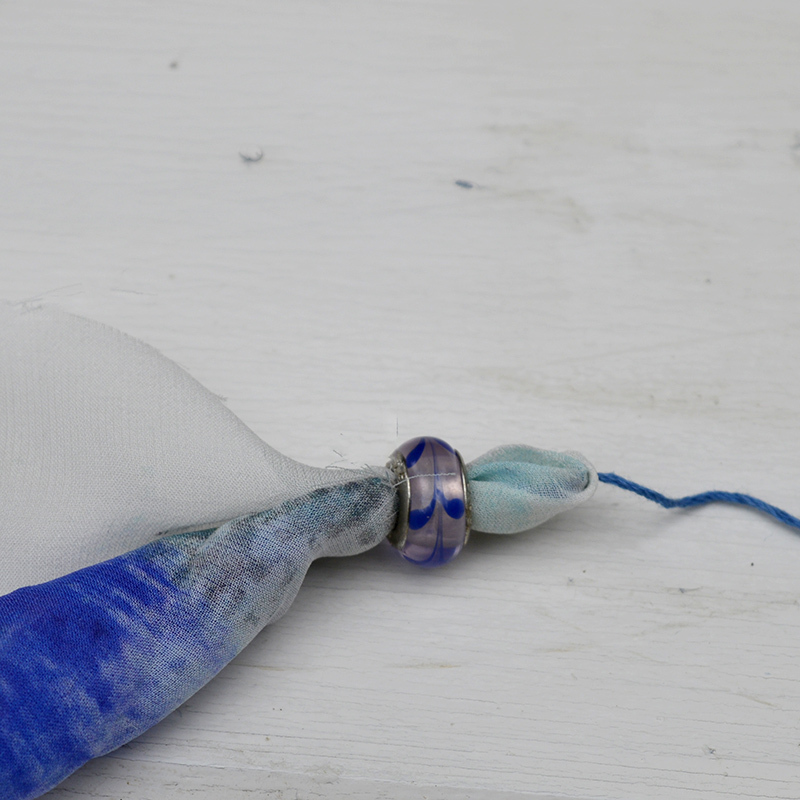 This will make it much easier to thread the fabric through the beads as you can use the needle to pull it though. 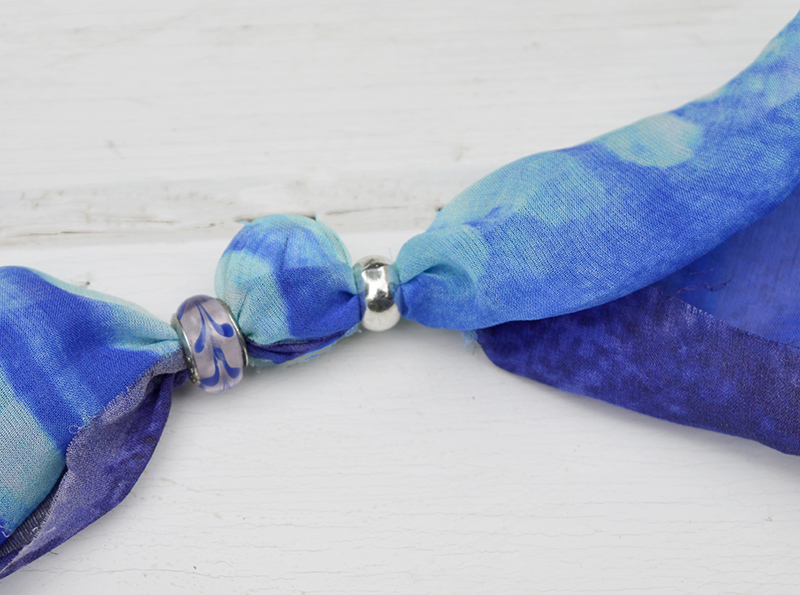 Think how you want your DIY jewelry design, I threaded the fabric through one bead and then wrapped the fabric round the next bead. The fabric then when through the following bead, twisting and pulling the fabric tight as I went. 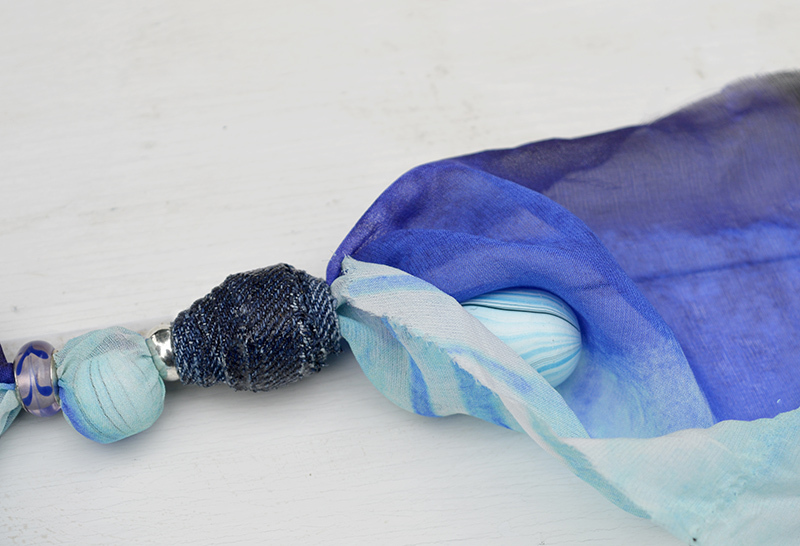 Wrapping the silk fabric round beads is what makes this DIY jewelry unique, and shows off your scarf design. 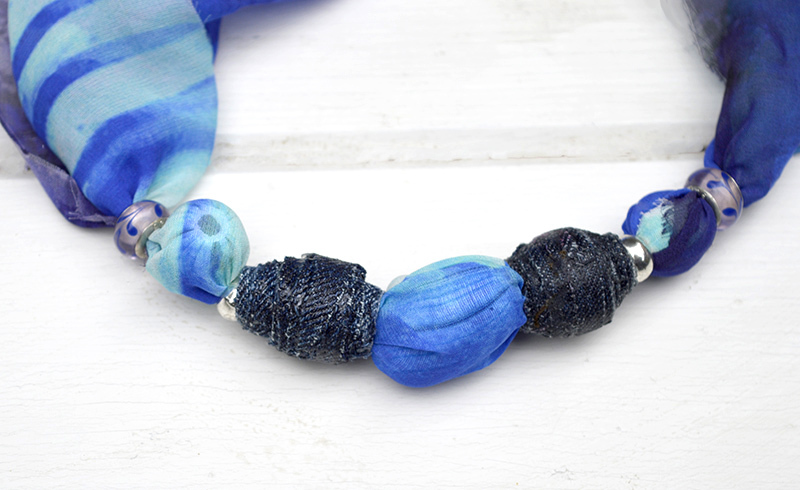 I used a mixture of wooden beads and denim beads, I had the denim beads on show and wrapped the wooden beads in the silk fabric. The denim beads are of course optional, you may want to make your DIY Jewelry with beads you already have rather than making some more. It really is a simple, and a great way to upcycle favourite old silk shirts and scarves and give them a second lease of life. If you liked this craft then you will propably like my homemade scallop trinket dishes. 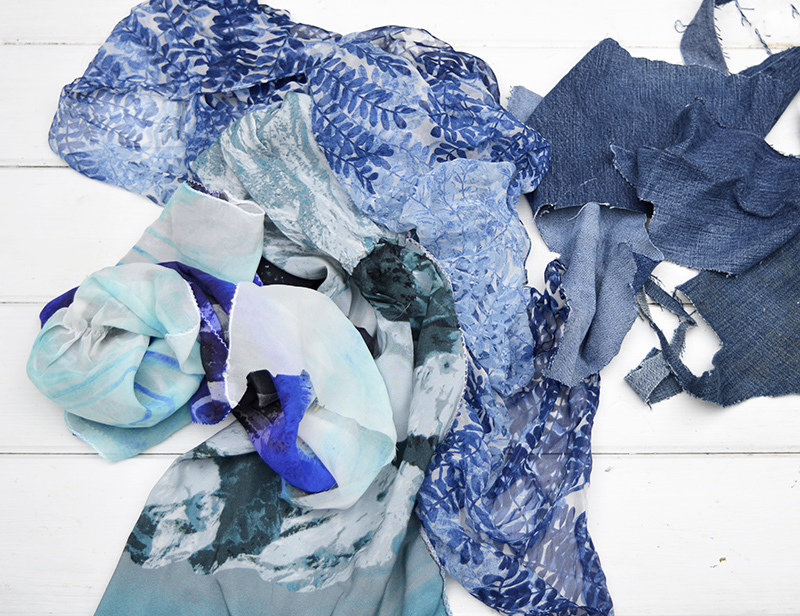 A good friend of mine is a Shibori artist and has a lot of silk fabric scraps, I can’t wait to try this! How did you twist the silk and hold it in place? Did you have to sew it? This really looks nice. You could make them casual (with denim) or dressy (with dressier fabric scraps). You could really individualize these for gifts, making different colors for different outfits. Your necklace turned out great! Thank you! My mum has made a few in different colours for different summer outfits. Do you have to sew the sides of the strips of scarf to keep from raveling? No, I didn’t have to sew the sides, I think because you twist the scarf that protects it. If you are worried about them raveling you could always just brush a bit of fabric mod podge on the edge of the fabric. I really love this idea! It looks beautiful and I can’t wait to try it, will be doing both denim and non-denium beads. I am always on the look-out for new things to try. I am a little confused about the wrapping of the beads but I am sure I will figure it out,do I just place the bead on the material and twist the material around it? Thanks so much for a great idea! Thank you ! Yes you place the material on the bead and wrap it round. Just make sure that the material goes through the middle of the beads sat either side of the wrapped beads and this will hold it in place. Love it! What a clever idea. Thanks for sharing at Funtastic Friday. Gorgeous necklace, I love this idea! There are so many scarves at my local thrift store that I could use for this. Thanks for the inspiration and for joining the DI & DI LInk Party. Thank you so much. It’s easy to pick up scarves really cheaply, I’m sure you’d find one in your favourite colours. Claire I have a ton of clothing that I refuse to get rid of . This would be a perfect way to repurpose the fabrics that are delicate. Great tutorial and very original necklace. I see where you get your talent from, kudos to your mom. Thank you! My mother was very crafty when I was growing up, some of it must of rubbed off. This is so creative, Claire & gorgeous colors! Thanks for sharing @Vintage Charm! Thank you very much ! I do like a bit of blue. 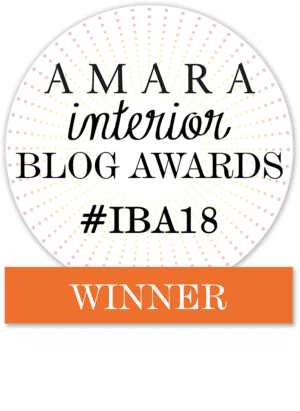 It’s very pretty, as someone who has a hard time throwing anything away I’m pretty sure I have everything I would need to make something similar – maybe it’s time to get in early with some Christmas gift ideas! Thank you Julie. I’me sure they would make lovely gifts. Wow, those are beautiful! 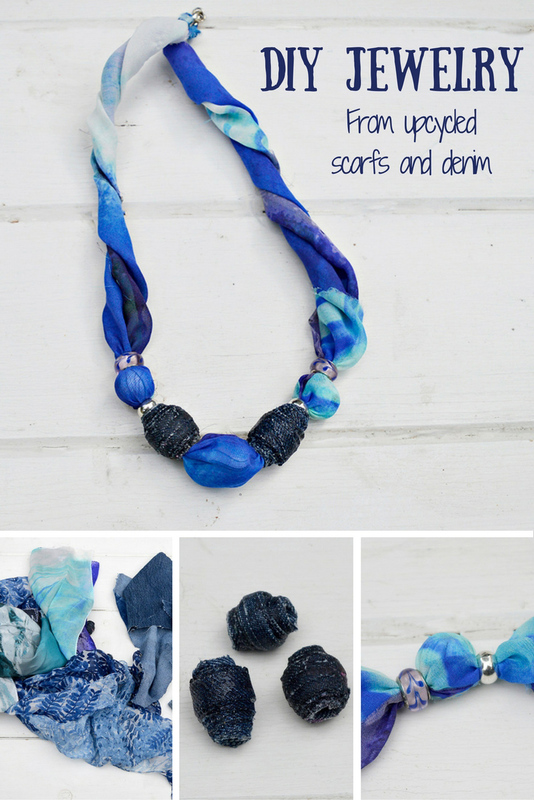 I never thought about making your own beads, or using a scarf to make a necklace. Your mum is brilliant, as are you!! Thanks Toni. 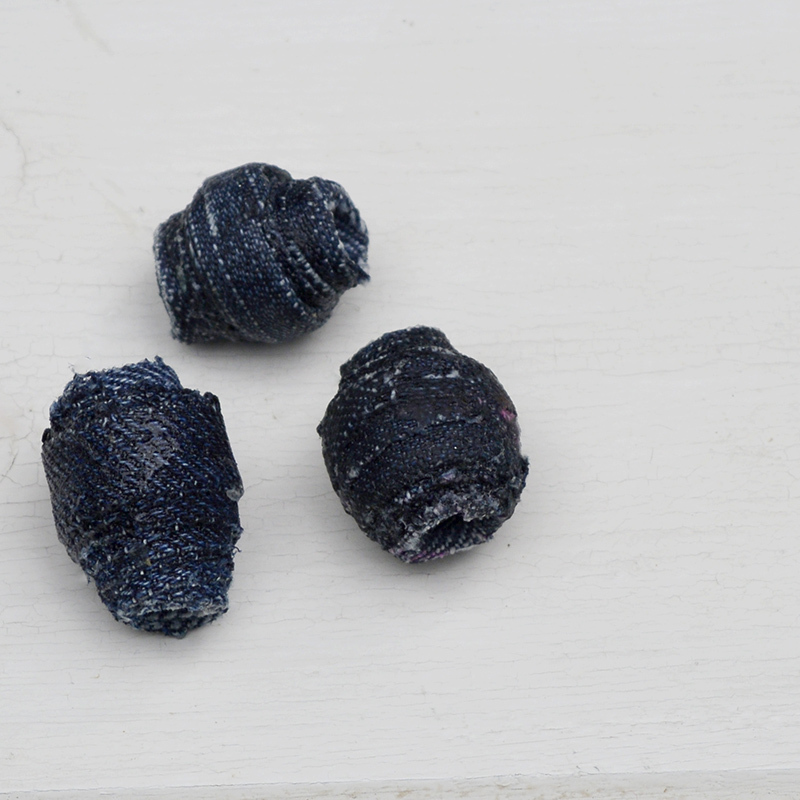 Denim beads are great and can be used for other craft projects too. Claire, I love this! So unusual! How cool! 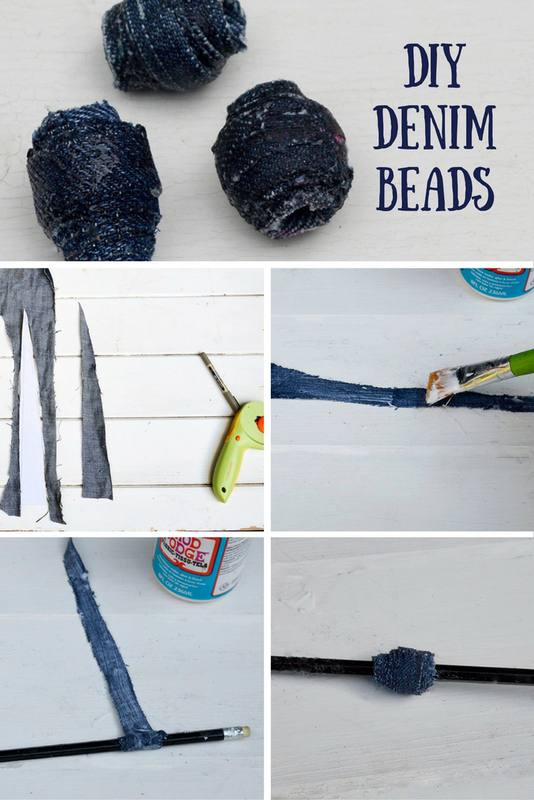 I never thought to use denim to make beads! I’ve been switching out all my son’s summer clothes for fall, and most of his jeans are too small now. I’ll need to try this! I have some other crafts in mind for the denim beads, I too have a lot of old denim. Thank you that’s nice to hear ! Wow! This looks really great. Now I have something I can do with my old jeans instead of shredding them for dog bedding. This is definitely more beautiful! Thank you ! I also make dog beds out of old jeans.